A few of my colleagues from Pratham Books and I were at Anatha Shishu Nivas (http://asn.org.in/) next to the famous Bull Temple in Bangalore. We were there to celebrate International Literacy Day with children. A little boy with bright eyes ran down to the gate to welcome us. "Are you going to tell us stories?" he asked in Kannada. Ten minutes later, he was telling us a story about the elephant god and the mocking moon, and the helpful snake. The little boy and his mates watched as Suraj and other volunteers put up our banner. P-R-A-T-H-A-M-B-O-O-K-S they chanted loudly in gay abandon. Then it was time to tell the story of 'Susheela's Kolams', written by Sridala Swamy and illustrated by Priya Kuriyan. The story got told first in English by yours truly, then by Bhavya, our lovely Kannada translator. Then in Kanglish – a sinful mixture of Kannada and English- by the children. Then with actions and laughs and smiles and shouts of joy. And finally, with chalk all over the premises of Anatha Shishu Nivas. 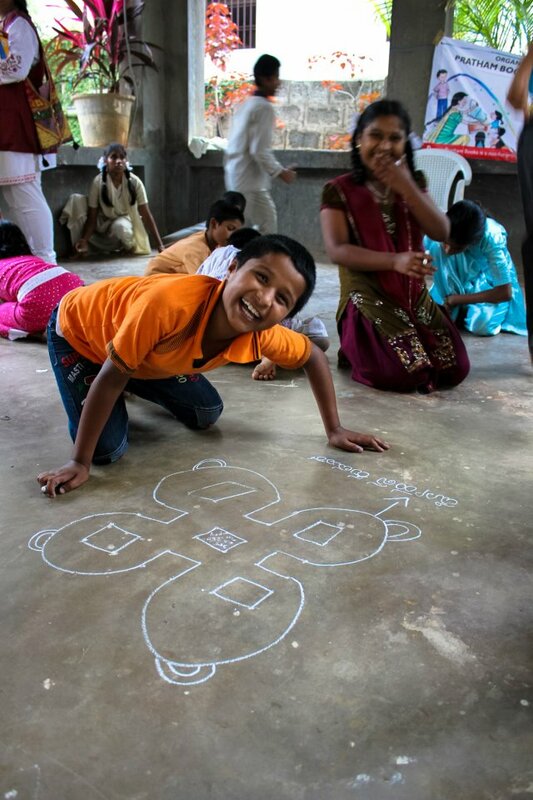 Children had fun drawing rangolis all over, much like little Susheela, the young protoganist in the book, who even drew on trains. “ But how can we drawkolams on trains and buildings?” asked a child during our session. "We can draw trains and a building, and draw rangolis on that, silly!" was the bright answer his friend came up with. A handful of the 55 children present there turned cartwheels on the grass, but all the others were totally engrossed creating patterns on the ground. The scene looked similar to the one in 'Taare Zameen Par'. They really were stars, these kids! Shy little boys tugged at our shirt of kurta to draw our attention to their kolams. Eager young artists dragged us upstairs and downstairs and inside and outside to show off rangolis. Everyone wanted the colourful Pratham Books' copies that we had carried. Of course, we left a set of our books for their library. “Next time, WE will read these books and tell YOU the stories!" said a girl. Yes, we're waiting to go back soon to hear her story, and the story of empowerement brought on by books and reading and literacy. Thank you Anatha Shishu Nivas for being such a warm home for these children and for welcoming us to be part of their day!